Endowed with natural and cultural attractions, Ethiopia has set its sights to be one of Africa’s top tourist destinations. In recent years, it has crafted an innovative sustainable approach to its tourism sector as a means to promote conservation and create job opportunities for its burgeoning population. According to the latest United Nations medium-variant projections, the population of Ethiopia—Africa’s second most populous country—is expected to nearly double from just under 99 million in 2015 to almost 188 million in 2050. This rapid increase in human numbers could seriously threaten the country’s environmental and sustainable development goals. To mediate these challenges, Ethiopia has implemented “population, health and environment” (PHE) programs that are considered very promising. The government has expanded family planning services nationwide by working closely with health workers and religious institutions—including the Ethiopian Orthodox Church, the country’s largest religious institution, with 43.5 percent of all followers. 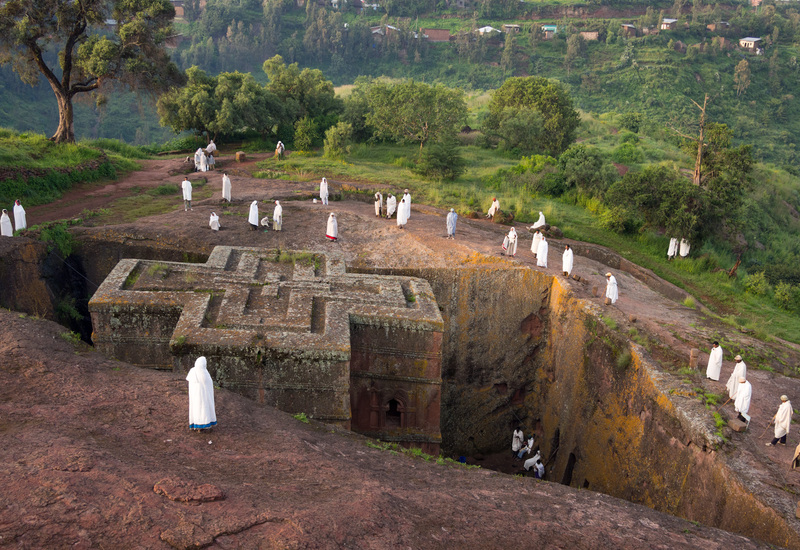 The Orthodox Church is also the custodian of many Ethiopian cultural and natural assets, such as Lalibela, a complex of 11 rock-hewn churches from the 11th and 12th centuries that has been designated a UNESCO World Heritage Site. Research indicates that population growth, urbanization, climate change, and tourism could pose risks to vulnerable and culturally significant sites around the world. By endorsing family planning and supporting efforts to keep Ethiopia’s population growth in check, the Orthodox Church and other religious institutions are helping to safeguard the country’s valuable heritage for future generations. The Orthodox Church also has a longstanding tradition of preserving ancient forests throughout Ethiopia. According to a report by the U.K.-based Alliance of Religions and Conservation, 40 years ago forest coverage around Abune Guba, monastery in northern Ethiopia, was 100 hectares. Due to the expansion of agricultural land, the surrounding forests have since shrunk dramatically, although the church acted to preserve 23 hectares in 2011. The church has a strong monastic tradition, and hermits and monks value the forests for seclusion and meditation. The church’s commitment to conservation may offer more opportunity for partnership—not just with governments, but also with non-governmental organizations—to link family planning, climate action, and conservation. Given rising public awareness of Ethiopia’s rapid population growth and the need to prepare for climate change, the engagement of the Orthodox Church in family planning and other environmentally minded activities could be especially effective in encouraging more sustainable behavior throughout the country. PHE programs and family planning promote a sustainable future for coming generations, while allowing communities to safeguard their heritage and traditions. All of these are important components of sustainable development and key ingredients for a healthy society. Banner photo credit: Lalibela, Ethiopia by CCTV-Africa. Yeneneh Girma Terefe is a research assistant at the Worldwatch Institute working on the Family Planning and Environmental Sustainability Assessment project. While obtaining his Master of Arts degree in anthropology at the University of Florida, Yeneneh specialized in cultural heritage management and worked on the nomination of Yemrehanna Kristos, a 12th-century church in Ethiopia, for the World Monument Fund’s 2014 Watch List. Wow! Finally I got a webpage from where I know how to in fact get helpful information regarding my study and knowledge.